As a nation, Thailand grew along the banks of its mighty rivers. For centuries, the kingdom's waterways have provided the Thai people with their staple foods of rice and fish, fuelled by the abundant monsoon rains that have made the land fertile. So it's little wonder that so many local ceremonies and traditions are water-based – be they intimate family rituals or nationwide celebrations. 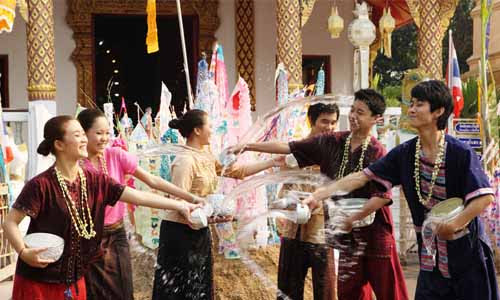 The most important festivals of the Thai calendar are celebrated with water. Best known of course, is the Thai New Year celebration of Songkran. For three days, during the hottest month of the year, the kingdom plays host to the world's biggest water festival. Every town and village hosts a frantic three-day water fight with young and old taking part, as a way of cooling off and coming together. Tourists love the fun and party atmosphere, but for local people, this is a family event. In homes and temples nationwide, people gather to sprinkle sacred water on images of the Buddha as a form of ritual bathing. In Thailand's mostly rural culture, this is a way of praying for ample rainfall in the growing season to come. This is also a time to pay respect to family elders. In what's considered the oldest ritual of Songkran, elders will daub the face and necks of younger participants with a white perfumed powder called dinso pong – this has long been seen as a way of warding off evil, but has also the added benefit of protecting the skin from the sun and even warding off spots – a Thai folk cure that has been passed down the generations. 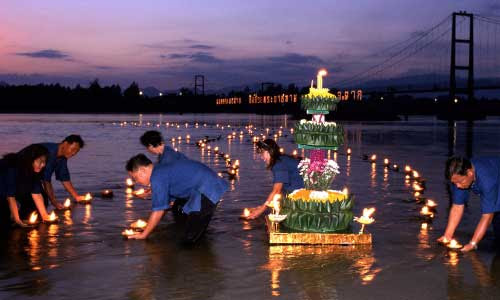 Later in the year comes Loi Krathong. Held under the creamy full moon of the 12th lunar month, the celebrations are aimed at giving a little back to the water gods, to thank them for their bounty over the year. Banana stalk floats, crewed by incense and orchids are released onto the kingdom's waterways. As these flowery floats bob out into the current, they take their owners' wishes for love, fortune and success with them. The charming festival of Loi Krathong is celebrated in varied ways. In the western province of Tak, the festival is called Krathong Sai, and the local krathongs are made of coconut shells, which are abundant in the area as well as throughout Thailand including popular beach destinations of Ko Samui, Ko Phangan, Phuket, and Ko Chang. These coconut shells are filled with wax and floated out into Tak's portion of the majestic river Ping. In the northern area of Chiang Mai, Loi Krathong is called Yi Peng and fire lanterns are released so the lights in the sky mirror the candlelit city canals below. H2O plays its part in more personal Thai ceremonies, too. At weddings, water is sprinkled upon the wrists of the bride and the groom to bless the union. Of course, now couples come from all over the world to wed in Thailand, and they often do this by taking part in traditional Thai ceremonies. But Thailand offers a wedding to match every taste. Real water lovers can tie the knot below waves in the famous annual underwater wedding off the coast of Trang. 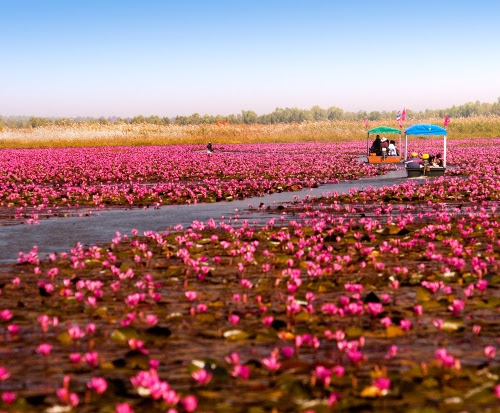 Other watery weddings can be enjoyed as couples float on the amazing Red Lotus Sea in the province of Udon Thani – be there from November to late February to enjoy the pink blossoms at their finest. For more memorable nuptials, how about a wedding on Thailand's highest mountain, or atop a mighty Thai elephant, the symbol of the nation? In this land of love you can do it all. Of course, Thailand's waterways and rivers have long shaped the kingdom's landscape and history. And it's the mighty Chao Phraya River, which flows through Bangkok, that's the most important to the kingdom's history. Three of Thailand's capitals were built along the banks of this River of Kings – Ayutthaya (1351-1767), which was both an administrative and religious centre, Thonburi (1767-1782) and then Bangkok, which was established in 1782 and thrives to the present day. 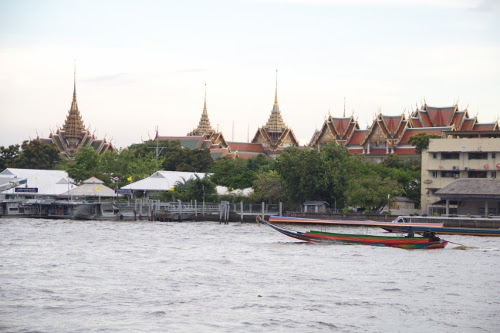 As Thailand opened up to the world, the Chao Phraya River became the gateway to the kingdom. Traders and ambassadors followed the local example and made their homes along the river. Even today you can find embassies, five-star hotels and trading firms on the banks of the Chao Phraya River. Bangkok grew up as a network of canals or khlongs, and the local residents made their homes either on boats or stilts above the waters. In the 1840s, about 90 per cent of the city's residents lived on the canals. Theatres, shops and restaurants were run from boats and people would go between them on small rowboats. This watery lifestyle led to Bangkok being called the Venice of the East. Now once again, the river is buzzing with new trade and industry. The most popular themed shopping venue of recent years, Asiatique, The Riverfront, built on the docks of the old East Asiatic Company, teems with local and international visitors, who come to shop, eat and to enjoy the riverside atmosphere. There is also the Yodpiman River Walk which recreates the glories of old Siam in its waterside mall created in a colonial style. It's a perfect place to get a feel for the river as a community. The Chao Phraya is opening up in other ways, too. The tranquil little park of Suan Nagaraphirom by Wat Pho is a good place to reflect and relax, and even hosts a Loi Krathong Festival from which you can watch the annual illuminated boat processions. 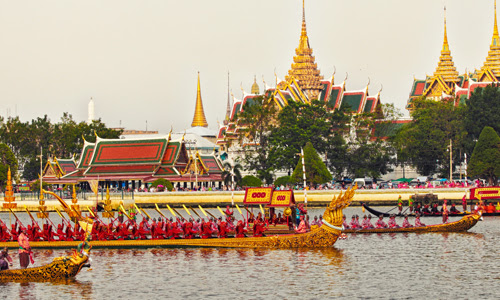 Above all, the Chao Phraya is a royal river, and plays host to one of the most spectacular displays in Thai culture – the Royal Barge Ceremony. More than fifty gilded barges are rowed majestically down the river by 2,200 sailors of the Royal Thai Navy. The Ceremony is to transport members of the Royal Family during special events; such as, when new robes are delivered to monks at the end of Buddhist Lent (Ok Phansa). It's a rare display these days as the delicate barges are only brought out on special occasions, but it's a very special sight if you're lucky enough to be in Bangkok when it takes place. It's worth going to see the barges at the Royal Barge Museum. They are amazing pieces of Thai craftsmanship. The original royal barges were commissioned by King Rama I the Great and the most impressive are decorated with figureheads from Thai mythology. Further afield from Bangkok, many water-based communities can be found. Thailand's famous floating markets remain popular and offer a great way to interact with local people, see how traditional foods are cooked and soak up the atmosphere. 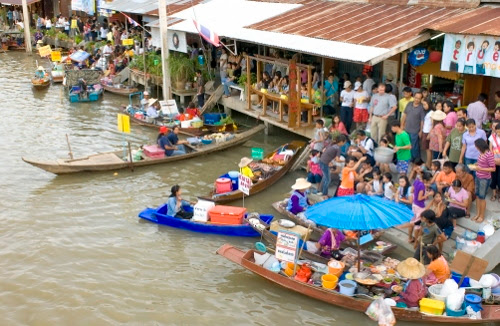 Many floating markets, like Amphawa in Samut Songkgram province, encourage local artists and artisans to come and show off their creations, which make for original souvenirs and can help fund grassroots organisations. Thailand's waterways are vital for everyone, from kings and commoners to everyone in between – rivers flow though the nation's history and have fuelled its culture and traditions. So tourists seeking real Thainess should take to the water – the real spirit of the nation. This is the story of Thailand's waterways, but there are thousands of other stories to discover. So tourists and travellers from around the world are invited to come and discover the many amazing stories in Amazing Thailand. In 2016, the Thai New Year or Songkran will take place from 13 – 15 April, with celebrations to be held up and down the country. Meanwhile, Loi Krathong will be held on 15 November nationwide, with special celebrations held in the ancient capital of Sukhothai. Copyright Tourism Authority of Thailand. All Rights Reserved. 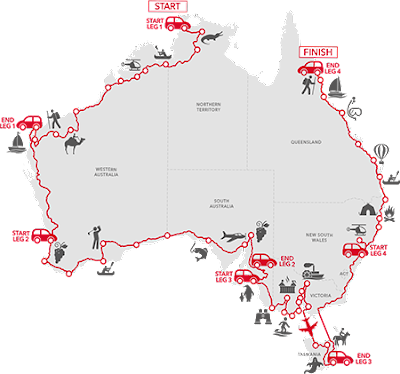 Eight road travellers have just completed 12,382 kilometres of the rich sights and sounds of Australia. They’ve travelled from Darwin to Cairns, the very long way round. They travelled around Australia in sixty days, as guests of Avis celebrating being 60 years young. From 15th September through to 13th November 2015 friends Joanna Bridle (29) and Jane Burhop (27), husband and wife team Michael (55) and Collen Kerr (52), couple Eva Koumbaros (34) and Harry Antonakos (34), and mates Max Watson (26) and Will Ross (26) steered their vehicle from Darwin through Jabiru, Katherine, Kununurra, Gibb, King Leopold Ranges, Derby, Broome, 80 Mile Beach, Beach Port Headland, Karajini, Nanutarra, Coral Bay to Exmouth; from Perth through Margaret River, Albany, Esperance, Norseman, Caiguna, Border Village, Ceduna, Port Augusta, Wilpena Pound Resort, Tanunda – Barossa Valley, Victor Harbour to Adelaide; from Adelaide through Mt Gambier, Halls Gap, Port Fairy, Torquay, Ballarat, Daylesford, Bendingo, Echuca, Melbourne, Launceston, Cradle Mountain, Hobart and back to Melbourne; and from Sydney through the Hunter Valley, Crescent Head, Belligen, Byron Bay, Noosa, Bundaberg, Rockhampton, Airlie Beach, Ingham, Daintree, and eventually Cairns. All eight agree that the experience was “heaps good.” They had encounters they never could have imagined, best of all because they drove their own journey. Their trips taught them personal travel tricks, and truly Australian experiences. 1. Always ask other travellers and locals for 'hot tips' of where to visit. You’ll find favourite places through general chit chat. Be super friendly and you will definitely find little adventures that you won’t ever read about in guidebooks. 2. As soon as you leave the city, you’d better have a large cooler. In the hottest parts of Australia, when you ask for ice you don’t get cubes; but solid 20 kg blocks. 3. Don’t be religious about travel guides. Just get out there, don't be lazy and pick what you think looks good. You'll be surprised. 4. 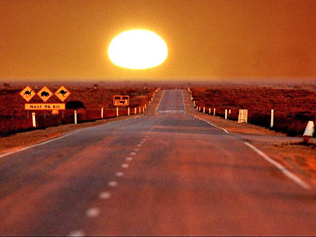 Driving Australia is the perfect digital detox. Because the road often takes you a long time between phone and internet signals. It’s perfect for truly connecting with people through sharing conversation, laughter and experience. 5. Get up early. You will want to see the sunrises and sunsets and allow time for all the tiny towns in between. 6. If you can, steer a 4WD. And make sure you know how to. It’ll take you to some breath-taking beauty that lies off the bitumen. 7. Just because it’s a driving holiday, don’t just drive. Take lots of breaks and stop at everything! 8. Keep your sunglasses close. Morning starts towards the east coast are blinding. Same goes for the afternoon drives west. 9. Many roads lead across big sky country – wide open places. So make sure you always travel with the essentials - lots of extra water, sunscreen, insect repellent, even a tent should you break down. 10. More bags are better than one. That way you can haul simple overnight supplies, keep your dirty washing separate, and you won’t put your back out by lifting one heavy piece of luggage. 11. Pack your boots. Australia is riddled with coastal, forest and hilltop hikes. 12. Plan less, discover more! If you plan for getting to a destination at a certain time you will tend to miss out on unexpected gems such as look outs or little discovery walks. 13. Road train drivers look out for you. They let you know when to pass, where the best stops are, and where not to buy coffee because it’s so bad. 14. Save as many music playlists to your digital device as possible! The great thing with music is that you’ll remember points on the trip when you hear the tracks in future. Qatar Airways is the national airline of the State of Qatar and one of the aviation industry’s big success stories. Operations began in 1994 when the airline was a small regional carrier serving a handful of routes. The airline was re-launched in 1997 under the mandate of His Highness The Father Emir, Sheikh Hamad bin Khalifa Al Thani, who outlined a vision to turn Qatar Airways into a leading international airline with the highest standards of service and excellence. Qatar Airways has since become one of the fastest growing carriers in the world with unprecedented expansion averaging double digit growth year on year. The airline has developed under the dynamic leadership of Group Chief Executive, His Excellency Mr. Akbar Al Baker, appointed in 1997, who has been instrumental in turning Qatar Airways into an award-winning carrier and the best in the world. Under Mr. Al Baker’s stewardship, Qatar Airways has matured into a leading force in regional and global aviation, earning many admirers around the world for its excellent standards of service. In April 2011, Qatar Airways reached a milestone reaching 100 destinations in its global route map. Two months later, the airline achieved a remarkable feat, just 14 years after its re-launch, being named Airline of the Year 2011 at the annual Skytrax World Airline Awards with over 18 million travellers worldwide casting their votes. In July 2012, Qatar Airways was once again named Airline of the Year 2012, holding onto its title for the second consecutive year. In June 2015, Qatar Airways achieved a major accomplishment receiving the accolade for a third time and becoming Airline of the Year 2015. In October 2011, Qatar Airways attained another key milestone by taking delivery of its 100th aircraft. During the Dubai Air Show in November 2011, Qatar Airways placed orders (firm and options) for 90 aircraft, comprising 80 of Airbus’ new A320 Neos, an additional eight A380 super jumbos and two Boeing 777 freighters. During the 2013 Dubai Air Show the airline placed orders for more than 60 new aircraft – a mixture of Boeing 777X and Airbus A330 Freighters. At the 2014 Farnborough Air Show, the airline placed an order for 100 Boeing 777X aircraft, taking Qatar Airways’ orders to more than 330 aircraft with a value of US $70 billion. Qatar Airways announced an order for 10 firm 777-8Xs and four firm 777 Freighters at the 2015 Paris Air Show, with a value of US$ 4.8 billion. Qatar Airways has also joined oneworld, as of 30 October 2013, with integration into the global alliance completed within one year of the October 2012 joining announcement. From Qatar Airways’ hub in Doha, the country’s capital, the airline has developed a global network of more than 150 destinations, covering Europe, the Middle East, Africa, South Asia, Asia Pacific, North America and South America with a modern fleet of more than 170 passenger and cargo aircraft. During 2010, Qatar Airways launched flights to 10 new destinations including: Bengaluru (Bangalore), Tokyo, Ankara, Copenhagen, Barcelona, Sao Paulo, Buenos Aires, Phuket, Hanoi and Nice. In 2011, another historic year for Qatar Airways saw the launch of flights to 15 destinations with expansion focusing on Europe – Bucharest, Budapest, Brussels, Stuttgart, Venice, Oslo and Sofia. Other new routes included Shiraz (Iran), Medina (Saudi Arabia), Kolkata (Calcutta), Entebbe (Uganda), Chongqing (China) and its entry to Canada with thrice-weekly flights to Montreal. For 2012, Qatar Airways expanded operations to further destinations – Baku (Azerbaijan), Tbilisi (Georgia), Zagreb (Croatia), Perth (Australia), Kigali (Rwanda), Kilimanjaro (Tanzania), Yangon (Myanmar), Baghdad (Iraq), Erbil (Iraq), Maputo (Mozambique), Belgrade (Serbia) and Warsaw (Poland). For 2013, Qatar Airways has expanded its global footprint to serve Gassim (Saudi Arabia); Najaf (Iraq); Phnom Penh (Cambodia); Chicago, its fourth gateway in the United States; Salalah (Oman), Chengdu (China), Basra (Iraq), Sulaymaniyah (Iraq), Clark International (Philippines), Ta’if (Saudi Arabia), Addis Ababa (Ethiopia) and Hangzhou (China). In 2014, the carrier launched flights to Sharjah and Dubai World Central in the UAE, Philadelphia (USA), Edinburgh (Scotland), Istanbul Sabiha Gokcen Airport (Turkey), Larnaca (Cyprus), Al Hofuf (Saudi Arabia), Miami (USA), Dallas/Fort Worth (USA), Djibouti (Djibouti) and Asmara (Eritrea) in Africa. 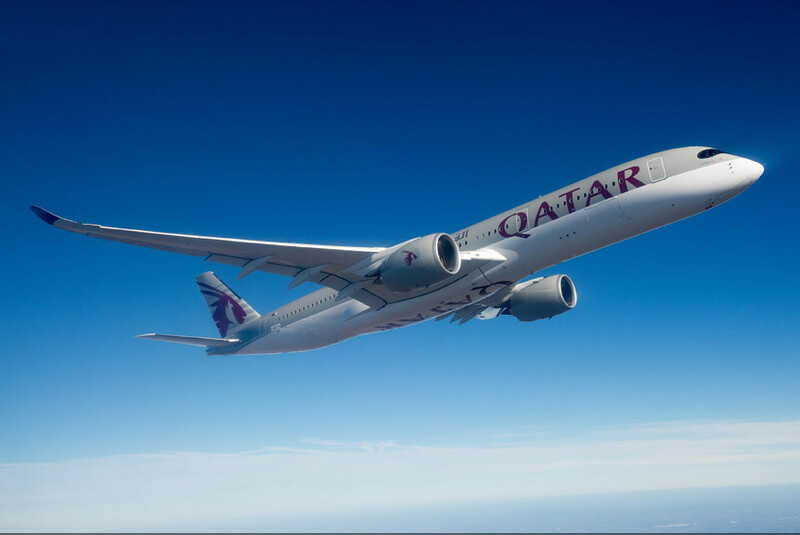 During 2015, Qatar Airways has extended its route network to more than 150 destinations including flights to Amsterdam (The Netherlands), Zanzibar (Tanzania), Nagpur (India) and Durban (South Africa). In 2016, the airline has so far launched routes to Los Angeles (USA) and Ras Al Khaimah (UAE). In the next few months the airline is further expanding its network to Atlanta (USA), Boston (USA), Sydney (Australia), Adelaide (Australia) and Yerevan (Armenia). Qatar Airways has also announced its expansion with an increase in frequency and capacity to many existing routes. operating one of the youngest fleets in the world, Qatar Airways has adopted the emotive and modern brand campaign to reflect its core values as a contemporary and innovative company that is really going places and wants nothing more than to inspire its passengers to do the same. From only four aircraft in 1997, the airline grew to a fleet size of 28 aircraft by the end of 2003 and a milestone 50 by October 2006. Today the airline operates more than 170 aircraft to more than 150 destinations worldwide. Qatar Airways has one of the industry’s youngest fleets with an average aircraft age under four years old. The Qatar Airways family includes several different Airbus and Boeing aircraft types – the long-range Boeing 777 passenger and freighter aircraft, the new Boeing 787, Airbus A340, A330, A350, A380, A300F freighter, A321, A320 and A319. The latter A319 includes a corporate jet version. With the delivery of the A350 XWB aircraft in December 2014, Qatar Airways became the first airline in the world to operate every family of Airbus’ modern airliner portfolio, comprising the A320, A330, A340, A350 and A380. Qatar Airways is one of the launch customers of the twin-deck Airbus A380-800 ‘super jumbo’ – the world’s biggest aircraft capable of carrying 517 passengers in a luxurious configuration. Qatar Airways has ordered 13 A380s with the first aircraft delivered in 2014. In December 2014, Qatar Airways became the global launch customer of the Airbus A350 XWB aircraft with the first commercial service being deployed on the Frankfurt route on 15 January 2015. The company also operates corporate jets, including Bombardier Challenger 605s, Bombardier Global 5000s and a Global Express XRS, for its executive subsidiary Qatar Executive, launched in 2009. Qatar Executive continues to expand its operations, placing an order for 30 Gulfstream business jets at EBACE in Geneva during May 2015. The 30 firm orders and options are a combination of Gulfstream’s new wide-cabin aircraft, the G500 and G600, and the existing G650ER. 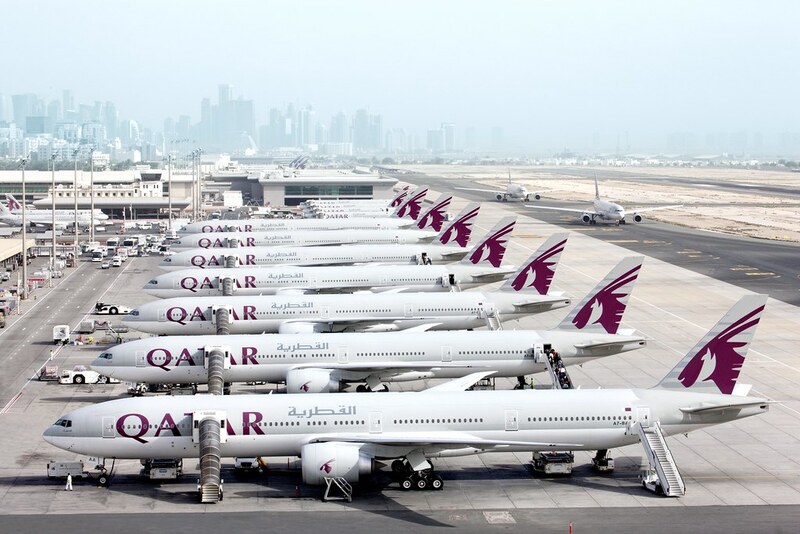 Qatar Airways currently has more than 330 new aircraft worth more than US$70 billion pending delivery over the next few years. This includes an order for Airbus’ new generation A350s, A320 Neos, A380s, A330 Freighters, Boeing 777s, Boeing 777Xs and Boeing 787s. Qatar Airways is proud to have been named Airline of the Year for the third time in 2015 as well as in 2011 and 2012 in the annual Skytrax World Airline Awards. Over 18 million travellers worldwide cast their votes in the survey by the leading global airline industry audit. Having been elevated to third best airline in the world by Skytrax in 2010, announcement of the 2011 results ranking Qatar Airways as Airline of the Year was a culmination of the sheer dedication and hard work by the airline’s workforce under the leadership of its Group Chief Executive His Excellency Mr. Akbar Al Baker. To retain the award in 2012 was a magnificent triumph. Already recognised for service excellence by Skytrax, the independent global aviation industry monitoring agency confirmed Qatar Airways as Best Airline in the Middle East for the eighth year and in 2015 Qatar Airways was also awarded Best Business Class Airline Seat. In 2014, Qatar Airways also won the Best Business Class in the World for the second consecutive year and World’s Best Business Class Airline Lounge for the second year consecutively. Qatar Airways was the first airline in the world to pass the International Air Transport Association (IATA) Operational Safety Audit with a maximum 100 per cent compliance in 2003 and passed the test again during the two-year renewal period in 2005, 2007, 2009, 2011, 2013 and in June 2015. The audit was set up to standardise and rationalise a number of safety and security procedures carried out by individual airlines for the purpose of code sharing. Qatar Airways was assessed on flight and ground operations, aircraft engineering, maintenance, operational security, cabin operations and management systems. Hamad International Airport commenced commercial operations in April 2014 at a cost of US$15.5 billion and with an initial capacity of 30 million passengers a year. Once fully developed beyond 2015, the airport is expected to handle up to 50 million passengers a year. One of the project’s key features is that 60 per cent of the site is built on reclaimed land from the Arabian Gulf. Qatar Airways is managing the new airport, designed to help shape Doha as a key regional and global aviation hub. During the 2003/2004 financial year, Qatar Airways carried 3.3m passengers, up 35% on the previous 12-month period. During the 2004/2005 financial year, passenger numbers rose sharply to 4.6m, while the figure topped 6 million in the 12-month 2005/06 financial period. The figure surpassed the 8 million passenger mark for the 2006/07 financial year and hit around 10 million passengers for the 2007/08 financial period. 2009/10, the airline exceeded 14 million passengers. During the 2010/11 financial year, the airline carried over 16 million passengers worldwide, hit over 17 million passengers in 2011/2012, and surpassed 18 million during the 2012/13 financial period. Qatar Airways exceeded over 26 million passengers in 2014/15. As an industry leader, Qatar Airways and its group of companies strive to lead the charge towards environmental sustainability and corporate social responsibility. The airline is one of the leaders in new-generation fuel research and gives back to the communities in which we serve. Qatar Airways goes beyond the current industry best practices for fuel and environmental management and is making a serious effort to ensure a sustainable future for the airline, its staff and its neighbourhoods. In 2012, Qatar Airways negotiated a worldwide partnership with Educate A Child (EAC), a global education programme launched by Her Highness Sheikha Moza bint Nasser of Qatar. EAC is designed to address the plight of 61 million out-of-school children around the world, who are denied access to quality primary education.